We all know this old classic musical, some more than others. I played Joseph in P7, and it holds some fond memories for me. OK it was a small rural primary school hence the fact a girl with limited singing ability got the lead role, but none the less it was my 15 minutes of fame. I was saved by the backing choir on more than one occasion so was intrigued to see some good singers perform these timeless songs. And it was quite a lineup indeed. With music by Andrew Lloyd Webber, lyrics by Tim Rice, Joseph played by ex X­factor finalist Lloyd Daniels and narrated by Amelia Lily, who was also an X­factor finalist and who has gone one to become a musician in her own right, it certainly was an all star cast. Lloyd Daniels captured the role of Joseph to a tee, he held the songs with a powerful voice and had the perfectly chiselled look and the dramatic moves that created a very believable, if slightly smug Joseph. Amelia too had a strong solos and carried her role with a distinct and glamours style. 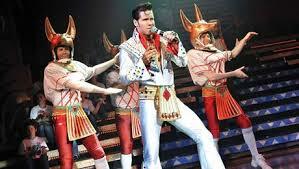 There was also the colourful Pharaoh, who appeared in the guise of Elvis and was played by Matt Lapinskas of East Enders and Dancing on Ice fame. A formidable character and great Elvis impersonator. Quite a varied and diverse line up to say the least, although there were moments where it felt slightly reminiscent of Sunday afternoon karaoke. To anyone who doesn’t know the story of Joseph, it is set in biblical times and tells the story of Joseph who is sold as a slave by his jealous brothers, but who’s abilities at interpreting dreams eventually saves him and he finds salvation and power which he then uses to torment and finally forgive his brothers. The musical however has very little dialogue or narrative and is basically back to back songs, most of which the audience know and love. These songs were all presented in completely different styles which I wasn’t expecting at all, and the performance is basically a juggernaut of genres, which although entertaining , felt a bit cluttered and lacking continuity. One minute if felt like kiddies Panto, the next Country and Western, then onto Calypso, then slightly camp Cabaret, then we were under the Eiffel tower in French fashion only to leap to club land where Elvis was crooning. The second half was dominated quite heavily by the Elvis character and the kids in the audience seemed to love the carnival atmosphere that was being created. The stage design I found slightly disappointing. I have seen some some musicals at the Playhouse in the past, and the set’s have been phenomenal. In this show there were two sets of stairways on the stage and other than lighting and backdrops occasionally creating slightly different environments the stage set up did not change at all. On the stairs sat 30 kids in matching tee shirts who were the backing singers. They did not move at all throughout the entire performance and I found this slightly jarring as the choir at times looked bored and a bit like they had been glued onto the set and told not to move. Saying that, in the songs where they did sing, their backing harmonies were angelic. All in all it was a fun montage of songs, old and new with an upbeat atmosphere. Perfect for kids and the younger audience seemed to enjoy the show, although I do think there should have been a few more jokes thrown in as it did feel like it was taking itself a bit too seriously. The X­factor element seemed to be very evident, with big voices, dramatic harmonies, backing dancers performing quite average dance routines around the stars and lacking any real narrative or substance. However this is not what the audience had come for and as we reached the finale the crowd was clapping and singing along and the packed playhouse was brought to life. A fun show for all the family that left most people with a smile on their face and a skip in their step.